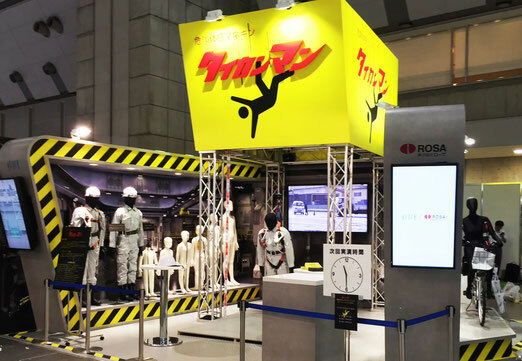 This is TAIKAN-MAN, a mannequin designed for danger sensing training. TAIKAN-MAN is a model of a standard adult male, measuring approximately 170 cm in height, and weighing 60kg. We are exhibiting a great variety of models designed for use in rescue training, including a model that can be dropped directly from a height of five meters, a model that does not become damaged even when trapped in a robot hand, and a model that can be suspended from a temporary scaffold. Model for factories and constructions sites where temporary scaffolds are frequently used. Model for electricity companies that are often involved in work with telegraph poles, etc. Model for factories, warehouses, and other similar workplaces where accidents with people being trapped are more likely to occur. The knees, waist, and hip joints of TAIKAN-MAN are made with special dampers. This allows you to witness a realistic display when doing falling demonstrations from high altitudes, almost as if a real person were falling to the ground. 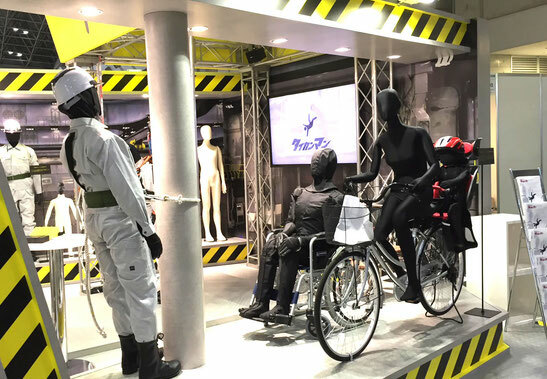 In addition, the mannequins can wear any clothing or equipment that workers would normally wear, such as helmets, work clothes, safety footwear, body belt type safety belts, harness type safety belts, etc. TAIKAN-MAN is characterized by its realistic design, featuring a human-like soft body and flexible joints, plus a sturdy construction, able to withstand the repeated impact, to hundreds of times, as required in training situations. TAIKAN-MAN allows people to learn practical danger sensing skills that are difficult to acquire only through classroom studies.